Are there any trends in our Talos regression bugs? Now that we have a better process for taking action on Talos alerts and pushing them to resolution, it is time to take a step back and see if any trends show up in our bugs. 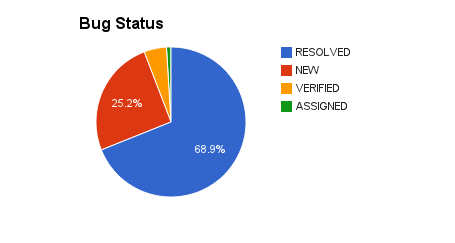 We started tracking alerts halfway through this process. 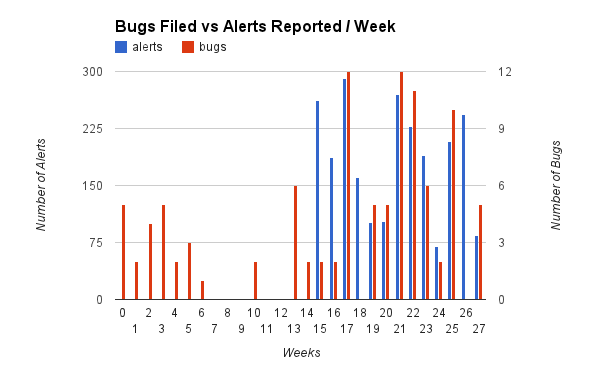 We show that for about 1 out of every 25 alerts we file a bug. I had previously stated it was closer to 1/33 alerts (it appears that is averaging out the first few weeks). 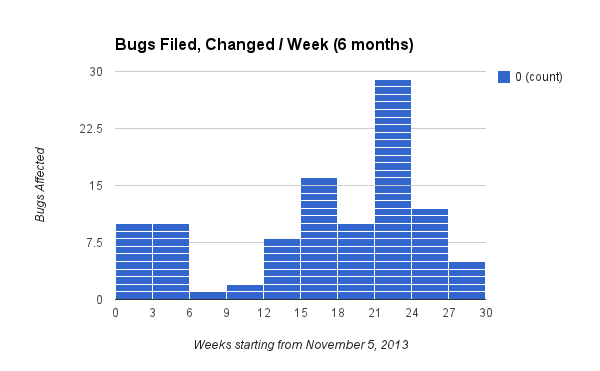 The fantastic news is most of our bugs are resolved in <=15 days! 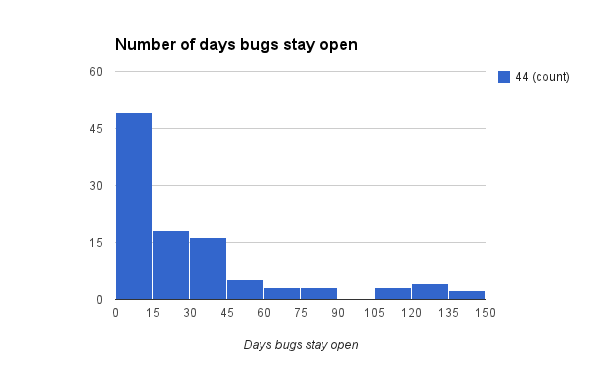 I think this is a metric we can track and get better at- ideally closing all Talos regression bugs in <30 days. 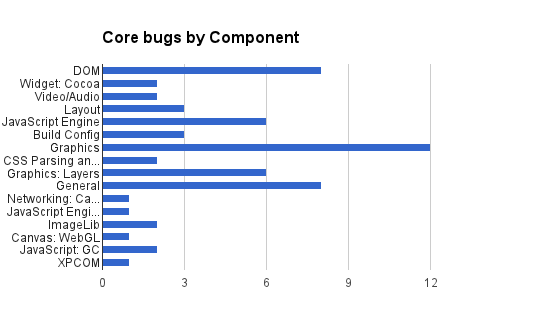 Looking over all the bugs we have, what is the status of them? Yay for the blue pacman! We have a lot of new bugs instead of assigned bugs, that might be something we could adjust and assign owners once it is confirmed and briefly discussed- that is still up in the air. 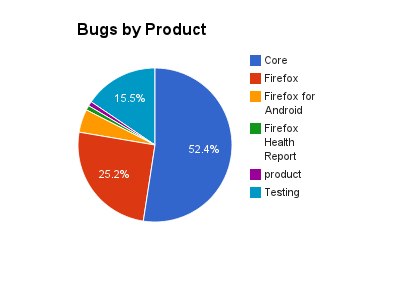 The burning question is what are all the bugs resolved as? To me this seems healthy, it is a starting point. Tracking this over time will probably be a useful metric! What information provided today is useful to track regularly? Is there something you would rather see? Talos is the framework used for desktop Firefox to measure performance for every patch that gets checked in. Running tests for every checkin on every platform is great, but who looks at the results? As I mentioned in a previous blog post, I have been looking at the alerts which are posted to dev.tree-management, and taking action on them if necessary. I will save discussing my alert manager tool for another day. One great thing about our alert system is that we send an email to the original patch author if we can determine who it is. What is great is many developers already take note of this and take actions on their own. I see many patches backed out or discussed with no one but the developer initiating the action. So why do we need a Talos alert sheriff? For the main reason that not even half of the regressions are acted upon. There are valid reasons for this (wrong patch identified, noisy data, doesn’t seem related to the patch) and of course many regressions are ignored due to lack of time. 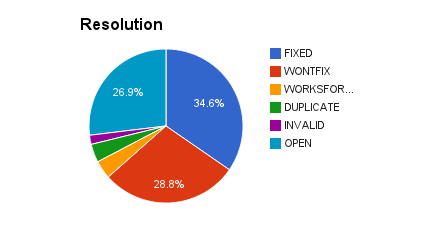 When I started filing bugs 6 months ago, I incorrectly assumed all of them would be fixed or resolved as wontfix for a valid reason. This happens for most of the bugs, but many regressions get forgotten about.